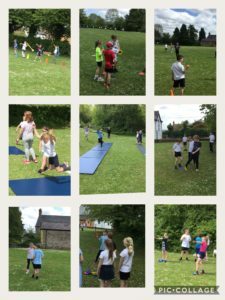 Last week, Bryn Offa year six pupils took a break from their SAT examinations to lead an athletic master class for the pupils from classes 3,4 and 5. The coaching skills on display were incredibly impressive and all pupils had a very enjoyable afternoon. Thank you Year 6 for all of your hard work. 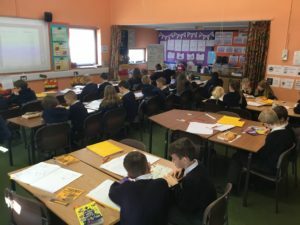 As part of our new guided reading initiative, Class 5 have been looking at the book ‘Street Child’ by Berlie Doherty. 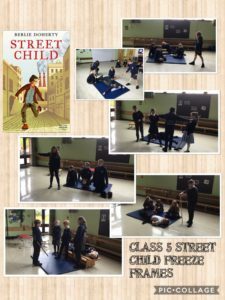 Today, the children have been creating freeze frames to tell the story at the point where the Jarvis family are kicked out of their house and onto the streets. 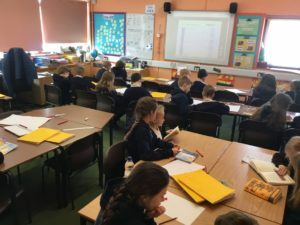 Currently, year 5 are spending a day each month working towards their John Muir Award with the Wildlife Trust. 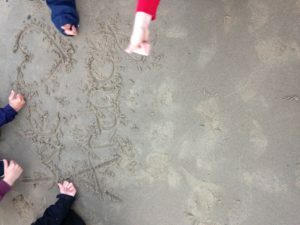 Yesterday they had a fantastic time visiting Treflach Farm. 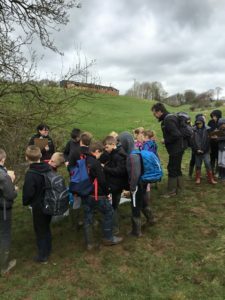 They saw some of the farm animals, did some pond dipping and even created lovely charcoal drawings of the surrounding landscape. 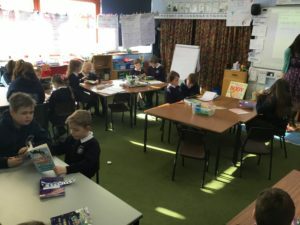 Classes 3 and 5 started a new reading initiative last week. 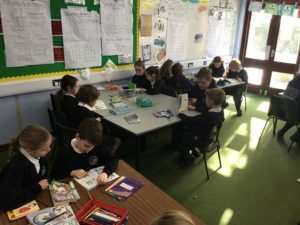 This involves the children working together and listening to each other read. 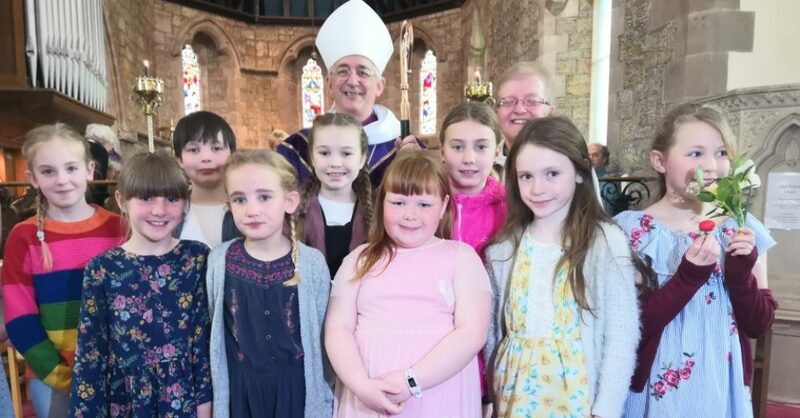 All children involved are really enjoying the experience. It’s already been a busy morning. Children have eaten, packed and are currently waiting for the instructors for our final activity before we depart. Their organisation and independence shown this morning has been impressive. I’m expecting to be back at school in good time for the 3:15pm collection. ­Our final full day has come to a close. Children had a morning of kayaking and canoeing on a beautiful lake. This was ended with many of them taking a run and jump off the jetty. Even the staff had a go. In the afternoon we altered the schedule so that it included a hill walk. Children pushed themselves and encouraged each other to complete the 3 mile route taking in breathtaking scenery as they went. This evening was the nightline, possibly the best night activity. Children had to complete an obstacle course through tunnels and tyres whilst blindfolded. 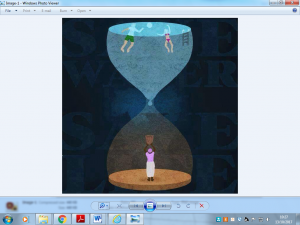 Communication was key – all were successful. Hot chocolate has now been drunk and lights are off. All children are looking forward to seeing their families when they return to Bryn Offa. I would just like to add that the behaviour of the children has been first class. It has been a pleasure taking them away. Instructors have been impressed with how well mannered and supportive they are to their peers. Children had a great night’s sleep and are now fully charged for the day after their breakfast. They’re currently emptying the drying room of slightly smelly clothes from the gorge yesterday! Please make sure you have plenty of washing powder for our return tomorrow. Wow! What a busy day. Both groups started with a gorge walk which ended in the slide of awesomeness. Everyone was thoroughly soaked but very happy. After lunch we had a rock climbing and rock pool combo. Some of the creatures the children found were amazing. Once the chidren had dinner and a shower we then walked over the bridge into Barmouth and back. Eva’s birthday cake with a hot chocolate was a fantastic way to end an unforgettable day. All the dormitories are very quiet, dreaming of tomorrows adventures.